While we were down there we spent the rest of the day on the beach. We were expecting it to be busy but it was very quite with just a few people here and there plus a couple of fishermen. The girls are more than happy to just to run around and play on the beach and we're more than happy to just sit back and watch them. Watching them edge closer to the sea and then dashing back when a slightly bigger wave approaches. The real highlight was getting to have a picnic on the beach and as an added bonus as we were away from the pier and other visitors we didn't get attacked by the seagulls. It was fun just to enjoy the fresh air without any distractions of phones or technology and watch a few boats sail past. As it was a Bank Holiday weekend we thought we'd find something a little different to do and take the girls to see something they wouldn't normally. 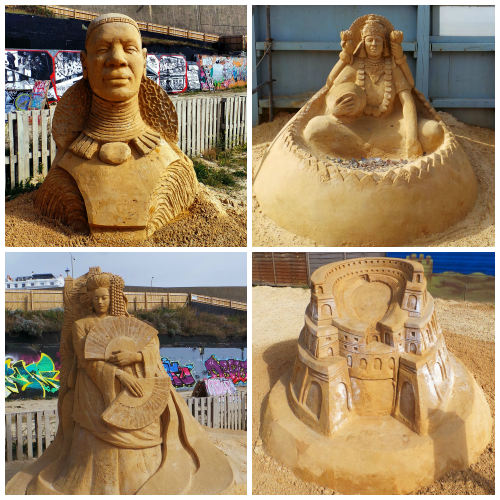 So we headed off to the Brighton Sand Sculpture Festival. The Festival is held from the end of April until the end of September so there is still time to go and visit. We headed down there on Sunday as we had a feeling Monday's weather would be rubbish (and we were right). For the 4 of us to go in cost us £12 which is probably one of our cheapest days out for a long time. The idea of the festival is to take you on a trip around the 7 continents of the World with easily recognisable landmarks. 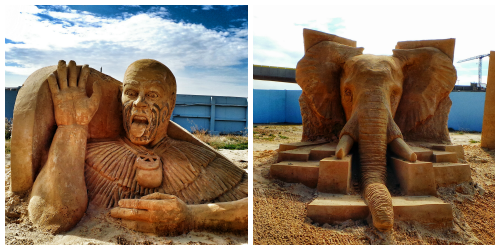 I wasn't sure what to expect from the sculptors but they are amazing, my photos probably don't do them justice as they are simply stunning and you forget that they have been made from sand. The weather was lovely which helped but even during the wind and rain they don't cover them up but I'm guessing occasionally they'll have to fix them a little bit. The elephant sculptor was probably the best, the detail in it's trunk is incredible. The girls enjoyed looking at all the different pieces and Aly was trying to work out what countries they came from. The real winner for them was that at the end of walk around the World was a large sand pit which they then spent the next 30 minutes trying to make their own sculptures. The main piece of the festival was this incredible piece which towered over everything, showing various parts of South America. The good thing is it's right by the seafront so you can pop there for a dip in the sea and a picnic...but that's for another post. This past week we've been on holiday at Butlins in Bognor Regis and this photo was taken on the beach and I quite like the editing on it. I love this photo, the girls enjoying themselves on a sandy empty beach, I wish we had a sandy beach near home instead we have a pebble beach. I hope you are all having a good Easter weekend and I look forward to having a look and all the brilliant photos.